An 8-year-old girl becomes convinced that her recently deceased father is whispering to her through the leaves of a massive tree that towers over her house. The Tree is a story of hope and recovery through the eyes of a girl and her mother, who is also struggling to cope with the death of her husband. 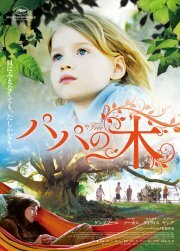 The film is based on Australian author Judy Pascoe's debut novel Our Father Who Art in The Tree. The role of 8-year-old Simone is played by Australian rising star Morgana Davies, who made her debut in this film. The film The Tree is French-Australian co-production.